The grace of thy mouth, shining forth like the radiance of fire, hath illumined all the inhabited earth. And it revealeth to the world no treasures of avarice, but hath shown us the heights of humility of mind. Instructing us by thy words, O father John Chrysostom, entreat the Word, Christ God, that our souls be saved. The honored Church was mystically gladdened by the return of thy precious relics; and having hidden them like most precious gold, by thy supplication she bountifully imparteth the grace of healings unto them that hymn thee, O John Chrysostom. Adult Education Class after Vespers on Wednesday. Vigil for the Feast of the Presentation on Friday evening, followed by Divine Liturgy on Saturday morning, at 8.00 am. Please also sign up for house blessings! 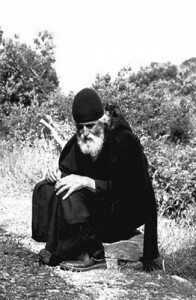 One time, some seniors from the Athonite School asked him (Elder Paisios) what they should watch out for most in their lives. And what do you think he did? Nothing different than what he usually did. He didn’t say, “Let me sit down and pray from morning till night.” No. He asked, “What kind of work do I have today?” He then told himself, “I have to go to the flour mill to grind my wheat.” He loaded his sack of wheat on his shoulders and went to the mill. Incidentally, when I first went to Mt. Athos, they still had those types of mills. There were neither machines nor animals to turn the millstone. It had to be done by hand, by the monks. It required a lot of hard, physical labor to grind the wheat. The moment Abba Agathon was ready to spread his wheat, another arrived and pleaded with him to let him go first because he was in a hurry. Abba Agathon replied, “Gladly”. The other person said, “Well, since you are here, can you give me a hand to move the stone? “Fine.” They finished the grinding and the other person got his flour and left. Then as Abba Agathon was about to unload his wheat, another person came, and it happened all over again. Then two more came along asking him for the same thing. Night came, and Abba Agathon was still unable to grind his wheat. He put it on his back and returned to his hermitage. This was considered by the monastic tradition as an example of perfect spiritual work. Abba Agathon did not complain. He did not get upset. He did not say, “Okay, fellows, you are from this area. I came from afar, from the desert. Let me grind my wheat.” Such example demonstrate that these hermits were blessed not because of prolonged states of fasting and prayer but because o simple acts of kindness that could be done by any one of us.